Towering in front of tall skyscrapers, these enormous trees appear to be thriving in the middle of the city. 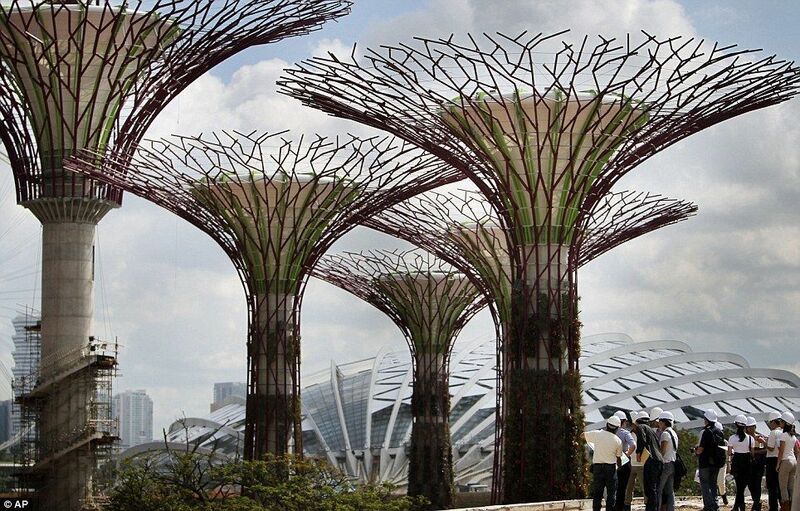 But the vast woodland in Singapore is actually entirely manmade, stretching up to 50 metres into the sky. The imposing trees have colossal concrete trunks weighing hundreds of tonnes. 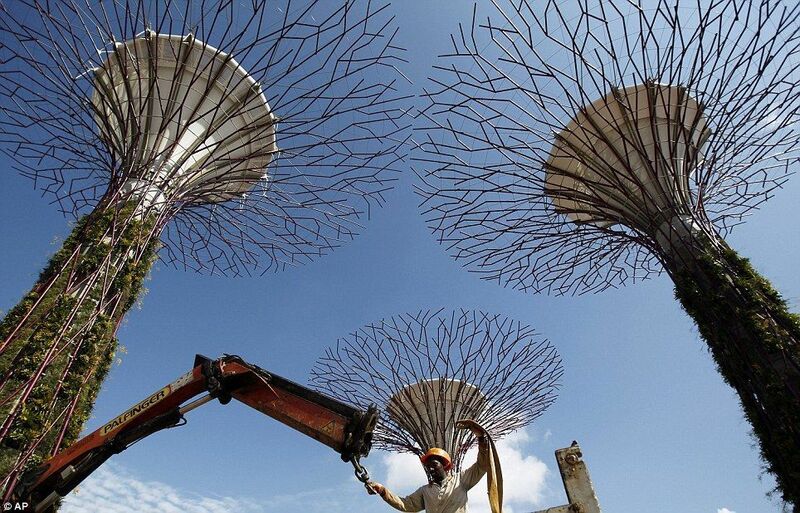 While thousands of thick wire rods have been used to create artificial branches and canopies. The incredible installation, which is still being built, was created as a national landmark as the island looks to create a vast green space in its Marina South district that will become the 'botanical capital of the world'. But the towering supertrees will be hard to miss for the thousands of people expected to descend on the recreation area. 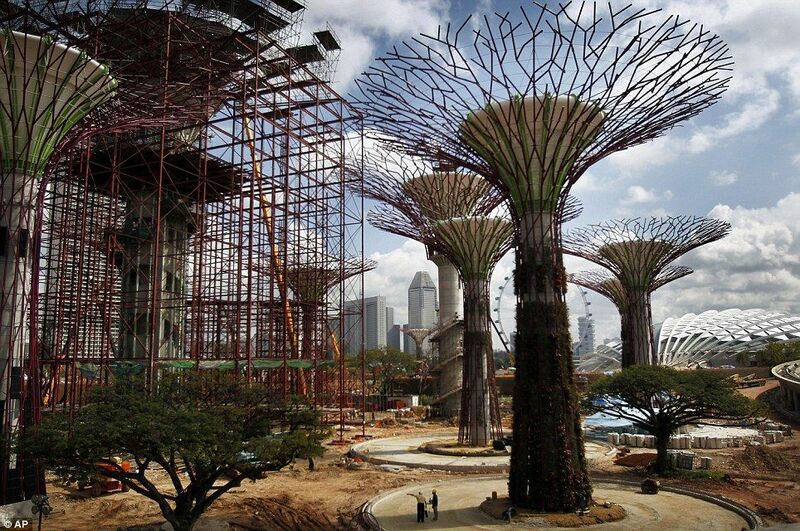 Each Supertree will have added to it a canopy weighing around 20 to 85 tonnes. This will be hoisted into place over three to four hours by a hydraulic-jack system. Steel frames are then added onto the sides to represent the dark bark of natural woodland. Environmental experts have even been drafted in to add solar panels to seven of the trees. The energy will then be used to light the areas below. The entire structure will house a cluster of green conservatories when it is completed by the end of 2010. Inside the trees there will be plants from around the world. 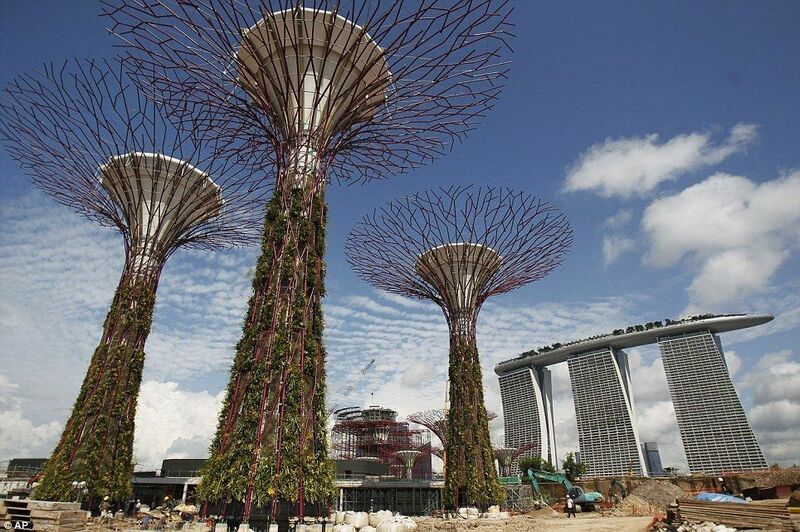 The park will also become home to the Singapore Garden Festival. Hanging gardens and rainwater catches will be added to the trees and a 22 metre high walkway will be made between two of the canopies allowing guests to take in a view of the scenery. The Gardens at Marina South is one of three waterfront garden projects under the massive Gardens by the Bay initiative, with the other two in Marina East and Marina Center. Leaders want to create a continuous ring of greenery, with the three gardens wrapping around the Marina Bay area. 'They have to be lightweight, they have to be maintainable and hardy, and a great amount of effort has gone into looking for plants that can actually be sustained on this living skin,' Kenneth Er from Gardens by the Bay told Channel News Asia. I want to see these when they are finished. I wouldn't want to be around to rake the leaves when they start falling every autumn. Actually a very cool idea. I'd love to see them. Pretty sad when we need to start making trees.